Objective: New India Manthan : Sankalp Se Siddhi Programme vision 2020 double farmers income . KVK Wardha had organized Sankalp Se Siddhi Programme on 29.08.2017 atTown hall Deoli, Wardha. Hon’ble Shri. Ramdasji Tadas , Minister of Parliament , Shri. bhise, Sabhapati , Zilha Parishad Wardha, Dr. C.U.Patil ADR, ZARS, Yavatmal , Dr. S.U.Nemade, Senior Scientist, KVK Yavatmal, Agriculture Department, Wardha were present for program. 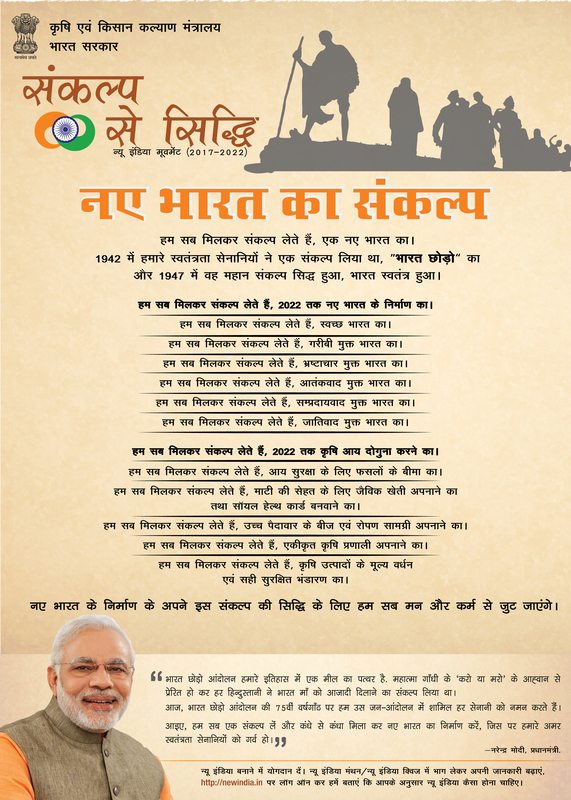 After inauguration, displayed the message of Hon’ble Prime Minister (Video), taken pledge. Dr. C.U.Patil ADR, ZARS, Yavatmal ,PDKV Akola and Dr. P.S. Umbarkar, Programme Coordinator, KVK Wardha explain the objective of Sankalp Se Siddhi Programme. Dr. S.U. Nemade explain the farmers about how to increase their income by adopting 7 points given in the programme. Hon’ble Shri. Ramdasji Tadas, MP appealed the farmers for doubling the productivity by adopting new technologies, efficient use of chemicals & fertilizers. Also given emphasis on processing & value addition of agricultural produce.